Fast approaching their second birthday, monthly party, Bodymove takeover Egg, London for a two-day weekender kicking off on Friday July 6th with influential DJ/producer, Darren Emerson, and continuing on the Saturday night as US DJ Spen flies in for an exclusive London set hot on the heels of ripping up last month’s Southport Weekender. Spen will be teaming up with UK house pioneer, CJ Mackintosh, fresh from detonating the Paul Trouble’ Anderson Allstar Macmillan Fundraiser at Ministry last month. 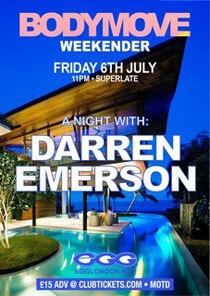 Playing a rare all night set in the capital, Darren Emerson, part of the original Underworld trio behind the massive ‘Born Slippy’ hit that soundtracked the Trainspotting movie, has a career spanning almost 20 years and is one of electronic music's most influential figures. He became a member of Underworld at the age of 18, and stayed with the group until 2000, helping produce massive singles like ‘Rez’, ‘Cowgirl’ and ‘Born Slippy’. He's DJ'd solo ever since, mixing several compilations for Global Underground as well as a few for his old label, Underwater Records, and produced the Ibiza classic ‘Scorchio' with DJ cohort, Sasha. As well as his influential Underworld productions and Underwater sessions events in Ibiza and beyond, Darren has recently launched a new record label, called Detone. Download a recent mix of Darren’s below. 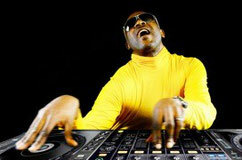 On the Saturday, DJ Spen will spin an exclusive four-hour set of spiritual house music, original tunes and killer remixes. 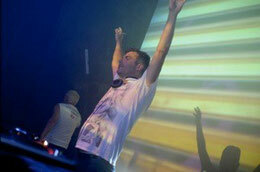 Spen is an explosive house DJ, combining vocals with thumping house, uplifting the crowd at every turn. His distinctive DJ sets have been rocking discerning dancefloors since he first came to attention as part of Baltimore’s Basement Boys collective, and it will be one of the highlight’s of the marathon Bodymove Weekender sessions. 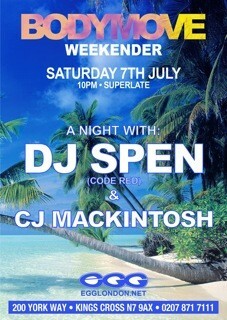 Download a recent DJ Spen mix below.